Connect the Solo to power and to your network. Go to solo.liveu.tv and create an account. Click on the + icon in the left column to add the Solo to your account. Locate the serial number on your Solo unit and enter it, along with your contact information. Click Next. Select the region that corresponds to the region closest to you. Click Save. 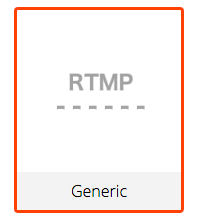 Under Destinations, click the + and choose RTMP Generic. Name the destination (HyperCaster, for example). Choose the appropriate profile. In most cases, this will be 1280×720 Widescreen (16:9). For Primary Ingress URL, enter rtmp://<IP_of_hypercaster>/telvue-rtmp. If you are streaming from on the same network as the HyperCaster, enter the local IP address of the HyperCaster for <IP_of_hypercaster>. If streaming from outside the HyperCaster’s local network, enter the external IP address. If you are streaming from outside the local network, you will need to ensure there is a port forwarding rule in place on your firewall. For Stream Name, choose a logical name, such as solo, liveu, remote, etc. This is case sensitive. Click on the Profile Settings (Advanced) dropdown. Check the Override Resolution checkbox and choose an appropriate resolution. Check the Bit rate (Kbps) checkbox. We recommend a bit rate of at least 2000, but 3500 is recommended. Check your upload bandwidth from the streaming location to gauge an appropriate bit rate. Log in to the HyperCaster’s user interface and navigate to the Config tab. On the Config tab, click on Live Streams. Click on the icon to add a new stream. For type, choose RTMP from the dropdown list. Name the stream something that makes sense to you, such as LiveU, Solo, Remote, etc. Enter the following in the RTMP Address field: rtmp://127.0.0.1/telvue-rtmp/<stream id>, where <stream id> is identical to the Stream Name entered in step 10 above. Leave Mux Rate (Mbps) field blank. NOTE: In order for the RTMP stream being pushed from the Solo to reach the HyperCaster from outside your local network, the port receiving the stream on your firewall must forward to port 1935 (UDP/TCP) on your HyperCaster’s management IP address. If you have a network admin who configures your router, you should consult with that person to make the configuration change.